According to Richard, the GZ Spin Trainer is planned to sell for $999 US and GZ Family Fit (3-in-1 Recumbent, Rower, and Gamercize) around $1399 US. WIBC (Wouldn't It Be Cool) - EXERGAME IDEA #3 ... imagine playing a game where you have to row to a cadence and collect special power up bonuses, and then after hitting 5 of these bonuses you or your and your sculling pals pick up that "2nd gear" or "2nd wind" and finish the race at a PB (Personal Best). I could also see a link into a game like Tom Clancy's Endwar integration where as you row you are accumulating points based on the game play but you also have the ability to provide feedback and encouragement to your crew playing the same room or in a RPG or MMOPRG. By saying the right things at the right time can earn you more points which in turn might give your team a competitive advantage. In physical education, we prepare our students to teach in the three domains of learning (physical, affective and cognitive) and a game like this could certainly cover all of them. 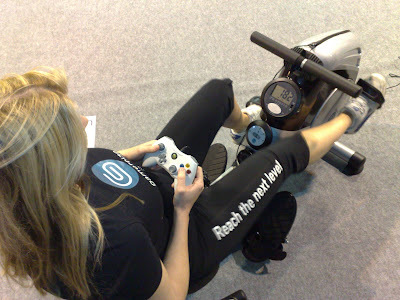 Aside from using the Gamercize features on the GZ Family Fit machine, "the use as a rower and as a recumbent will extend the appeal to the entire family - gamer or not!" 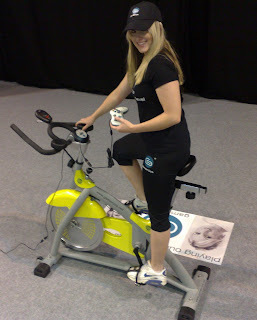 WIBC (Wouldn't It Be Cool) Exergame Ideas #1 & 2 found here. Previous Gamercize posts here, here, and here.